Quercetin is a bioflavonoid that supports cellular health, endothelial health, and healthy immune function. 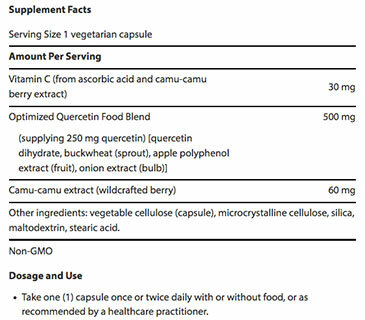 Optimized Quercetin delivers 250 mg of standardized quercetin in a bioavailable super food blend, as well as vitamin C and camu-camu berry extract to further support a healthy immune response and more. Quercetin is a bioflavonoid found in red grape skins, red onions, apples, buckwheat, peppers, red wine, berries, cherries, leafy green and cruciferous vegetables and other food sources. Quercetin supports healthy cellular function, cardiovascular health, and has also been shown to encourage a healthy immune response — especially to seasonally changing environments. Quercetin is well-known for its anti-histamine, anti-viral, and anti-inflammatory activity, but its effects reach even farther. This antioxidant brings a positive influence on metabolism, compromised T3 and thyroid related distress. Other research shows that quercetin shows great promise in counteracting obesity-associated complications. In addition to its benefits as an antioxidant, anti-inflammatory, and anti-diabetic effects, quercetin changed the expression of several adipokine genes, like leptin. Most recently, quercetin was evaluated in context of polycystic ovarian syndrome (PCOS) metabolic syndrome, obesity, and AMPK and adiponectin receptors. PCOS and thyroid disorders often coexist and are a metabolic puzzle for girls, women and future generations. In a randomized, placebo controlled double-blind clinical trial, it was found that oral supplementation of 1,000 mg of quercetin per day for 12 weeks significantly improved the metabolic features of PCOS. 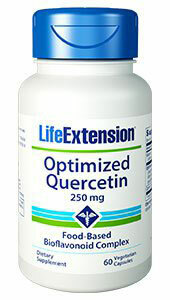 Quercetin helped a number of metabolic genes, adiponectic receptors, and AMPK. In human cell culture studies, quercetin has been shown to block the manufacture and release of inflammation-causing substances such as histamine,15-18 which can help support a healthy immune response, especially to seasonally changing environments or hives. Optimized Quercetin blend also contains vitamin C and camu-camu berry extract to further promote healthy immune function. Am J Clin Nutr. 2008 Oct;88(4):1018-25. Arch Pharm Res. 2008 Oct;31(10):1303-11. Eur J Pharmacol. 2010 Sep 10;642(1-3):134-9. J Immunol. 2010 Jun 15;184(12):6815-21.